Are you looking for something completely different in a ring? Then look no further. 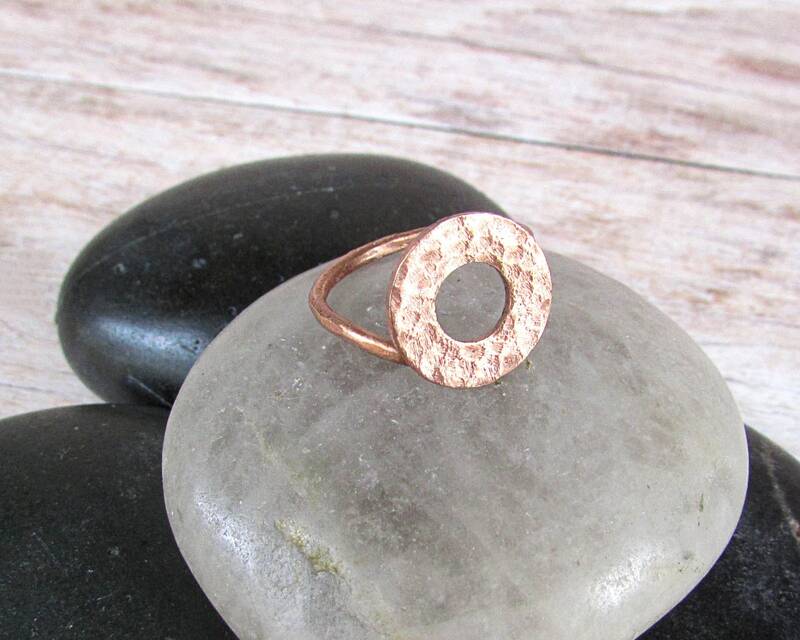 This unique "O" ring is definitely that. Want a ring that is gender neutral? This ring is perfect with its unisex styling. This ring has been artistically forged from pure copper and expertly soldered together using nickel, lead, and cadmium free silver solder. The band is formed from 18 gauge American copper that has been hammered and attached to a beautifully hammered copper washer. These lightweight and easy to wear rings are perfect for those who love statement rings but hate the bulk and weight of them. All edges are smooth and free of burrs. Center of the ring measures approximately 1/2" across. This ring has been beautifully polished and quadrupled coated in jewelry grade shellac to help preserve the metal and prevent it from turning your finger green. THIS LISTING IS FOR A SINGLE RING ONLY. Photos are shot at close range using MACROS setting in natural light. Texture and dimensions are highly exaggerated by this process.